ARCOMPANY | Our First Blended Generation Think Tank: The Multi-generational Workplace – Can GenY, GenX and Boomers Co-Exist? Home / Blended Think Tank / Our First Blended Generation Think Tank: The Multi-generational Workplace – Can GenY, GenX and Boomers Co-Exist? Across the web and within business communities, there is much talk about the Future of Work; economic and technological influences as well as the inherent shifts in demographics that will ultimately impact our work place have us sitting up and taking notice. How it will radically change everything as we know it. Where where social becomes engrained within the organization. How the workforce economy will morph into a predominantly mobile and entrepreneurial one. ….This rich mix of generations in the workforce can be attributed primarily to labor shortages experienced in many industries and the rising average age of retirement. Interestingly, according to the same study, in 2006, Boomers held the majority of positions of power and influence in organizations across the U.S. and around the world. By 2025 year, the Millennial Generation will outpace all generations and comprise 75% of the workforce. This will have significant impact on how an organization will eventually change. However, until then, the current mix of generations in the workforce needs to be addressed. These shifts impact corporate culture since priorities, attitudes, expectations, and work styles differ among each generation. Michele Price – Boomer, Entrepreneur/Owner of Digital media agency and business radio show. Samantha Estoesta – younger GenY, Non-profit Public Interest Research. What motivates you to excel at your job? The panel agreed: money is a not a driver. Motivation to excel is entirely personal. The work ethic is intrinsic and all are driven by excellence. For Ryan, as a Hedge fund manager he picked the job because it was extremely difficult and challenging. Both Tiffany and Samantha were drawn to the non-profit sector. Tiffany points out that she is always learning and will never reach the point of perfection because of new situations and new technology. Samantha has exposure to both the non-profit side and the campus experience. She is exposed to peers who make much more than she does, however, her passion is driven by the work she does with those who are marginalized. There is a stereotype that Boomers are all about the money. That is not true… do not use money as a tool to shame people. There is nothing wrong with making money if that’s the result of doing something really well. Steve Dodd, whose job is incentive-based echoes the group sentiment. I have lost everything 3 times in my lifetime. Both Tiffany and Samantha argued that they chose their professions because of the work, the rich experiences and relationships they receive. Both could be making more money in corporate America and Canada for the same work they are doing. Both have student debt and they realize that they have to deal with this reality or at some point and “get uncomfortable”. As a GenXer, Mary came from a lower socio-economic upbringing and indicated that it’s less about class and more about money management. Mary was 28 years old when she bought a car. She admits that she used the school loan for “stupid stuff.” She didn’t know how to manage debt. But she also believes that Millennials have a better understanding of debt today. Compared to when GenX was younger, there is more exposure to this issue and more resources available today. Back then, debt was something nobody admitted to nor spoke about. Ryan, as a GenXer, took this viewpoint: managers should be able to work effectively “autonomously.” Managers typically offload the work instead of managing properly. Professional managers are best leaving people alone and supporting their people upwards and guarding anything that may go wrong. Can your boss also be your mentor? Tiffany works in an environment where her manager also runs the organization. He does not have the expertise in her particular profession to teach her and guide her as a mentor. So, in this capacity he may be unable to properly give her the advice she requires, however he can clear the path to help her do her job effectively as well as mentor her with the big picture. As a Millennial, Samantha had a mentor– one who would meet with her regularly and keep her on track. However, in her current organization, the structure is flat so there is this organic system of “sharing gifts” that allows each individual to mentor each other as well as the board members. For her generation, Samantha notes that they have to be driven to be a jack-of-all trades because the job market is not as lucrative as it used to be. The more skills they have, the more opportunities it will yield. How do you communicate at work? What are your communication challenges? … or when the Millennial junior studio executives who would sign-off “whatevs”! Tell US in real time, otherwise how are we expected to learn. And they’ll be mad and maybe they’ll quit but they are probably NOT the ones you want on your team anyway because they are NOT mature enough to handle it. However, maturity is NOT limited to a generation. When I have something serious to say, I go directly to the individual -face to face – because I need them to see my face, hear my voice and understand there are next steps and implications… As long as they’re on my team, their appearance, their voice and their choice of words reflect on me, as the manager. It may be indicative of what’s happening today. Perhaps there aren’t enough people in management positions, who are willing to have the necessary and difficult conversations. Samantha says her position she is transparent with students about work opportunities. They are told directly they have to “up their game” and gain the necessary skills in order to obtain a recommendation for work opportunity. Mary added, “Idiots are NOT generational.” These incidences have risen in volume NOT because of demographic proportions, but because there is more media coverage paid to it. Steve noted that society has raised an attitude of narcissism over the course of generations. We make people out to be the best or right… they unchallengeable. Everyone is out for themselves and this has taken center stage over a cooperative engagement environment. We never taught RESPECT for anybody else. We’re teaching if it’s not good for you, then run!…However people need to feel a part of something in order to be engaged. Regardless of the tenure of your employment, you will be better going out THAN coming in. I argued that given the state of the economy we are all in survivalist mode. 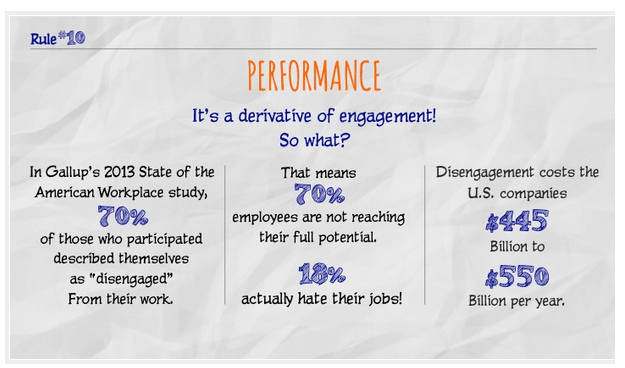 This justifies why companies and individiuals lack the engagement or work loyalty. I work in a freakin’ hedge fund. This is a tank of sharks. You earn it or you get eaten. I work in an environment that weighs in a zero-sum game. If I made $10 Million it’s because I took it from someone and beat him to death with a rusty pipe. It’s a gladiator ring. If you can survive that then you get my professional respect. For both Samantha and Tiffany, perhaps in an economy which no longer promises long tenures at any one place, being able to build respect over time is more challenging. Samantha does not expect to climb the corporate ladder. “It’s no longer linear”, but perhaps a much longer path that means more lateral movements over time. For Tiffany, she’s in a position where there is no real movement upwards. She can decide to stay there as long as she wants or choose to move where there is more upward mobility. While there is no real expectation to move up quickly within the workforce, at least for Millennials, they do have choices. Hessie, that was a great wrap up for our conversation. It truly is funny to watch as people naturally draw lines in the sand. Why do I say naturally? Because we all come from our primitive brain as a response, it is how we are wired. Once you or I start recognizing that consciously (how our brains are wired), then we can move into our reasoning mind and make better choices. Hi @prosperitygal:disqus would love to see your keynote. I completely agree with your viewpoint. People draw lines in the sand when it comes to pitting generations between each other. Funny thing: generational behaviours and values evolve with experience and those same things we were called when we were younger don’t necessarily apply anymore. Stereotypes are just that. What this blended panel tells me is that there are differences within generations that we have to understand. This is a function of culture, geography, exposure/influence of media. I love Mary’s line: “Idiots are NOT generational”. It just means we all have that common ground that unites us all. It was a great discussion. Would love to get into more details next time. The more we talk about this kind of stuff, the better. Liked your perspective Steve re: motivation, and workplace management. I think that’s probably a stronger thread across generations than people think. As a Millennial I’ve seen that desire for growth labeled as narcissism and me-first, but I know plenty of folks (myself included) who want more consistent and thoughtful feedback in the workplace so that we can develop our experience / skills and actually do better work / contribute value. I can’t work for someone who doesn’t want me to do the best I’m capable of, and I try to exercise that same perspective when I’m managing or mentoring. Plus people who aren’t self-directed and invested in their own growth aren’t as productive and can’t protect you from what you don’t know (culture as risk management isn’t talked about nearly often enough). Joe, couldn’t agree more! The key in my mind is to “bite tongues” and have respect for the opinions of others while coaching. It’s a complex game but we all can learn a lot from each other if we’d just shut up and listen. Then ask for more information, and listen again….. The kicker now is that we’re all forced to react quickly and sometimes that eliminates patient reflection, quality coaching and thinking. Joe, we all want the same thing. The challenge is to figure out how to get there. And believe me, I screw it up every day LOL! Seriously, same here. Saw something the other day where someone said re: diversity in tech that we need to get more comfortable with being uncomfortable. Something I practice a lot, but it’s definitely acquired and we need more of it. Brilliant!!! One day we’re going to dig into this. It’s so fundamental and touches the core of who we are, why we are that way and what we have (will) become.